I’m so very proud of all of our athletes this past weekend. In five different locations, we had some amazing performances. 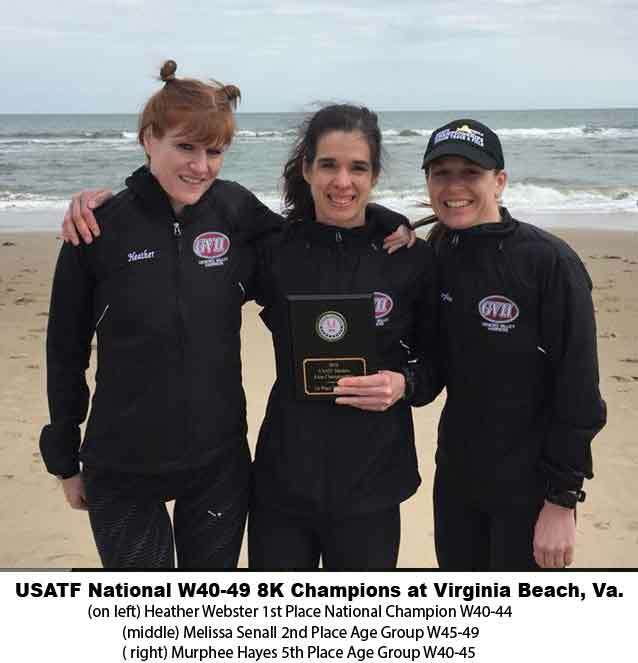 Three Individuals and two Masters Teams won National Championship titles in Virginia Beach and Maryland, our Men’s Open Team won the Team Championship at the NYC Half Marathon with had some superlative individual performances by both men and women. We had a winning 1-2 winning combination at the local Johnny’s Shamrock 5 miler. We had the winner of the Brooklyn Spring Half Marathon along with many personal bests/age group podium finishes all across the East Coast. It doesn’t get much better. 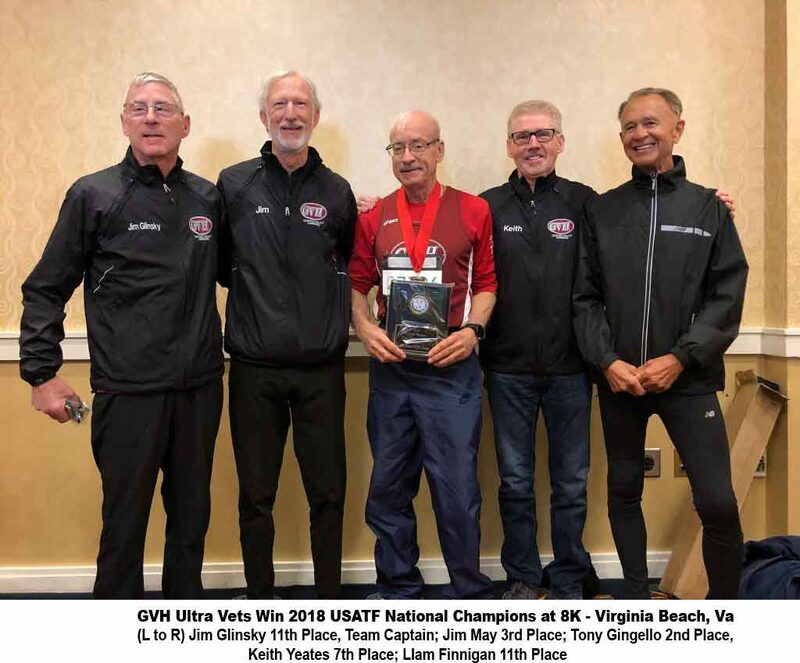 The GVH Masters Women 40-49 and UltraVet Men 70-79 won the USATF National Masters 8K Championship in Virginia Beach, Virginia on Saturday. Heather Webster led the ladies by winning the individual National 40-44 title in a fast 31:23. She was joined by teammates Melissa Senall in 34:21 2nd in the 45-49 AG and Murphee Hayes in 34.48. The UltraVet 70-79 Men’s team was led by Tony Gingello in 35:03.who placed 2nd individually was followed by Jim May who also made the podium with 3rd place individually. 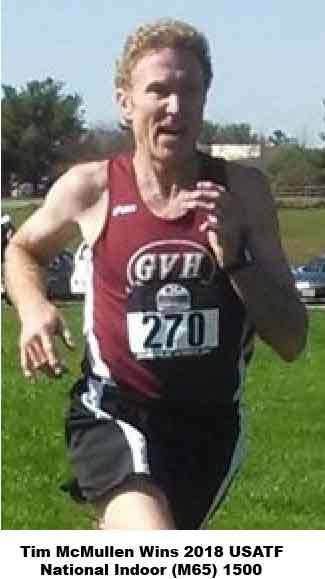 Keith Yeates, Jim Glinsky, and Liam Finnigan contributed to the team with fast times. The Ultra- Vets have an almost year-long streak of always making the podium The Women’s 50-59 of Tracey Vanetta, Kathy Hayden, Colleen Magnussen and Gail Geiger took a 3rd place team finish. The Men’s 50-59 team of Dale Flanders, Tim Riccardi, and John VanKerchove took a third-place team finish and put points on the USATF Grand Prix scoreboard for the year as did the Women’s and Men’s 60-69 Teams. The W 60 team included Sharon Moore, Cindy Ingalls, Cyndi Guth and Jeanne Herrick. The men’s 60 team included Kevin Clinefelter, Gene Jensen Mitch Moore, and Gary Radford. A fun time by all in the celebrations after the event including a polar bear dip in the Atlantic. 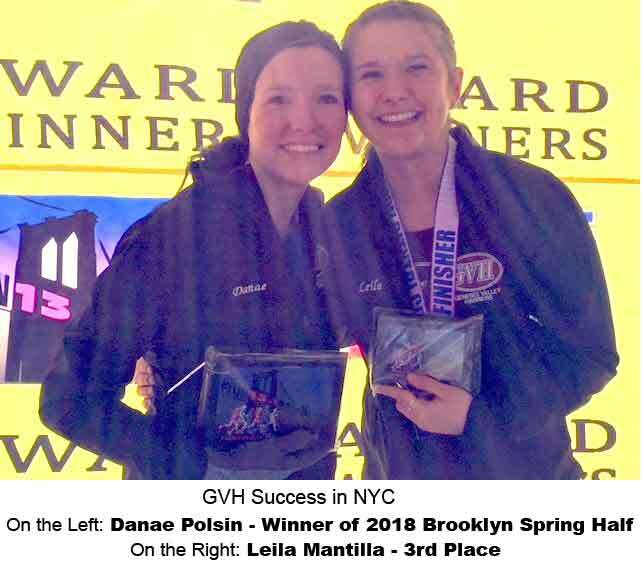 In other action on Saturday morning Danae Polsin won the Brooklyn Spring Half Marathon in a nice 1:27 with Lelia Mantilla taking 3rd in 1:30 on a cold, windy, hilly day in Prospect Park Brooklyn They both ran really well and had the Open and Men’s teams cheering them on from the sidelines as they prepared for the next days NYC Half marathon. Congratulations to both Danae and Leila. 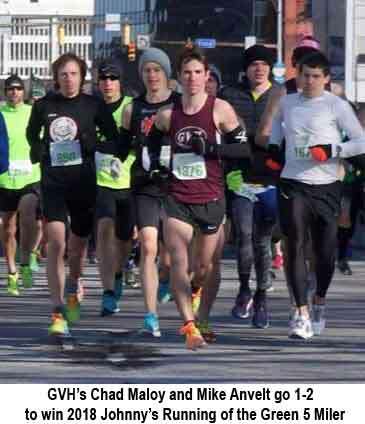 Also on Saturday morning back in Rochester at Johnny’s 5 mile two of our Open Men went 1-2 in the race. Chad Maloy was coming off an injury but ran a swift 26:02 for 1st place in very cold conditions. Right on his tail was teammate Mike Anvelt with a nice 26:16 for second place overall. Great race guys! On the ladies Open side Melissa Johnson-White took first place in 30:10 while GVH runners Mary Baughman took 4th overall in 31:59 (1st in AG 20-24) with newbie Georgia Tuttle 5th in a nice 32:12 ( for 2nd in AG 20-24). 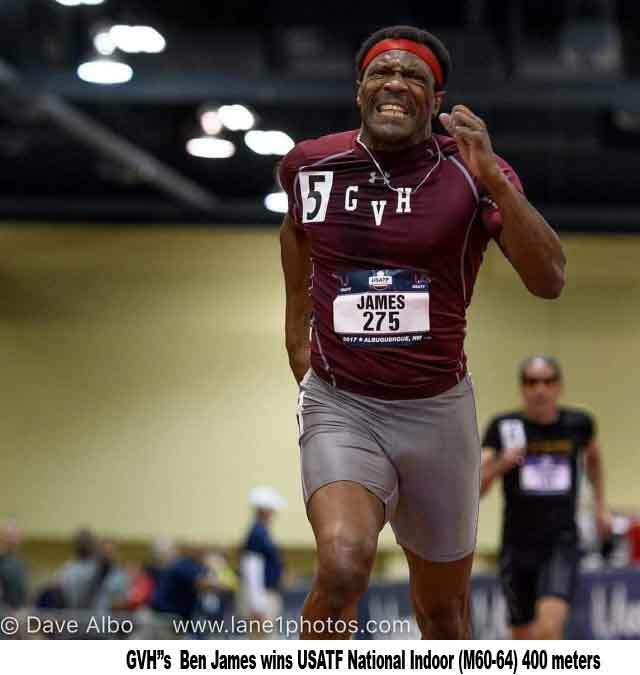 Also on the Men’s side newbie to GVH and multi-time Olympic Trials Qualifier, Chad Johnson, age 41 took second place in the M40-44 AG, his first race in a half dozen years. Bonnie Lindblom won the W50 and Lynda McQuire the W70 age groups. A big thanks to Mort Nace and all the Volunteers who made the morning run smoothly. In the 3000meter run Mark Rybinski, M60-64 took 5th in a speedy 11:20.35 and Andrew Bucci, M45-49 took 6th in 10:22.78 (PR) Dave Bowen ran a great 800 m time in the M65-69 for 5th place in 2:47.74. Relays are also a fun part of any indoor.National Championship so in the M60-69 4 x 800m our men pulled off a nice 2nd place finish in 11:25.43. The team included: Mark Rybinski, Dave Bowen, Doc. Rappole, and Tim McMullen. In the In the mens’ 4 x 400-meter relay Ben James., Anthony Baker, Kenny Hudson, and Sam Gray ran a fast 4:37.20 to take 3rd place honors. On the Women’s side, the only GVH participant was Caroline Bucci, W45-49 who made the podium in the 3000-meter event with, 3rd place in a time of 12:14.72 ( a PR) Congratulations to all. 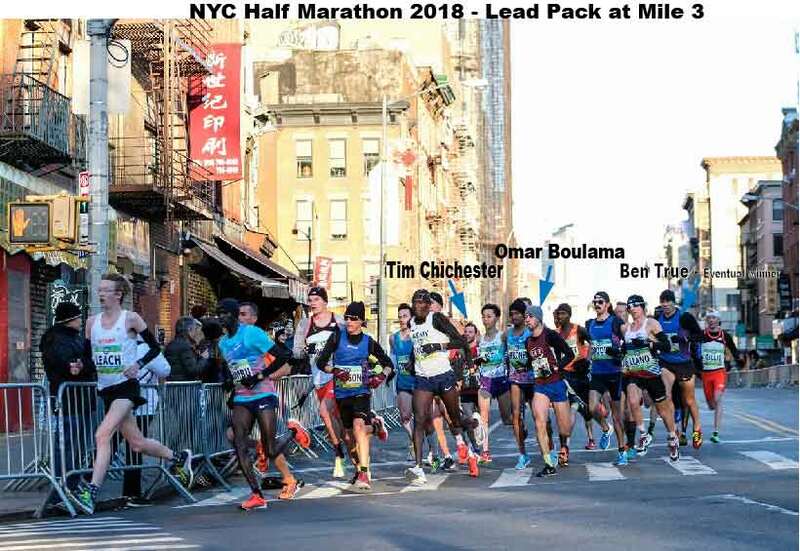 The NYC Half Marathon was a targeted race back in December for our Elite Open Men and Women. It was AMAZING but not a surprise to Coach Reif. . . . in cold, wind and hills . . . that our Open Men WON the Team Title. The team of Tim Chichester 1:05:42 20th place (5 min/mile pace), Omar Boulama 1:08.07 – 29th place, Tyler Eustance 1:13.14, Matthew Pierce (team Captain) 1:13.29 and Brennan Root 1:17.05 combined to come out on top of an elite field from across the USA. 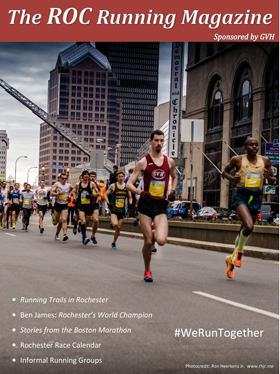 Over 22,000 runners and some of the best in the USA/World . . . Way to go Men! The ladies team likely would have won also but unfortunately, a “morning of” injury to one of our women runners left us shy of a complete Open team. The women’s team of Kathryn Potter 1:19.43, Ashley Nevol 1:21.31, Danielle Groff (team Captain) 1:21. 45 and Rachel Pinney 1:28.34 ran extremely well in the tough conditions. Both men and women are running phenomenally well. Carol Bischoff (W50-54) also ran with a very swift 1:43.49 finishing in the top 3% of her age group. Coach Reif ran a steady 1:53.39 in the M65-69 age group and was happy to see the finish line in his hometown of this nostalgic trip. It’s where it all began for him as a competitive runner some 57 years ago. Next story Masters 10K Road Nationals 2018, Dedham, MA.